(15/P7) TRENTON – Some 570,000 healthy and robust rainbow trout will be stocked in waters across New Jersey for the spring trout season. As many as 180,000 of these feisty fish will be stocked by the time the season kicks off April 4. In the coming months, the DEP’s Division of Fish and Wildlife will be stocking only rainbow trout, a hearty species that is resistant to furunculosis, a disease that has impacted brown and brook trout reared at the Division’s Pequest Trout Hatchery in Warren County. In consultation with other states that have had to deal with similar issues resulting from this common cold water fish disease, the Division of Fish and Wildlife has taken aggressive steps to eliminate the disease from the hatchery. Raceways used to raise the fish have been fully disinfected and increased measures have been taken to deter birds, which are suspected of having transmitted the disease from the wild to the hatchery. Furunculosis cannot be transmitted to people. All designated trout waters will be stocked this spring. Rainbow trout will be the only species raised at the hatchery for the next several years, until the future introduction of disease resistant strains of brook and brown trout can be established. Anglers also should note that adult, 2-year-old rainbows, averaging 15-16 inches, will be ready for stocking once again this fall. 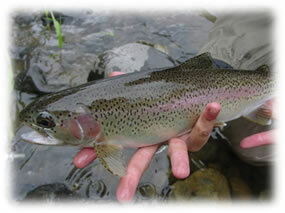 Rainbow trout released in the coming months will average 10.5 inches long. 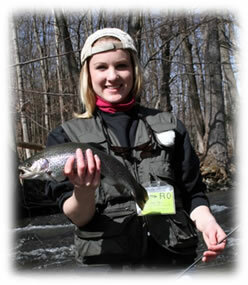 For more information on the trout stocking program, visit: http://www.njfishandwildlife.com/trtinfo.htm. The full stocking schedule will be posted in March.